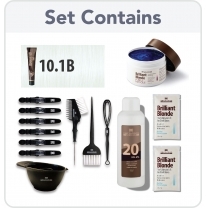 Check to make sure that all parts of the hair are lifting well. If you see parts that are drying out or not lifting, add in some more mix. Wait until your hair is a very pale yellow (level 10). Pour in 3.5 oz (100 ml) of your developer (1:1 mix) and mix thoroughly. Apply first on the lengths, leaving the last inch near the root for the end. Aim to get great product saturation. 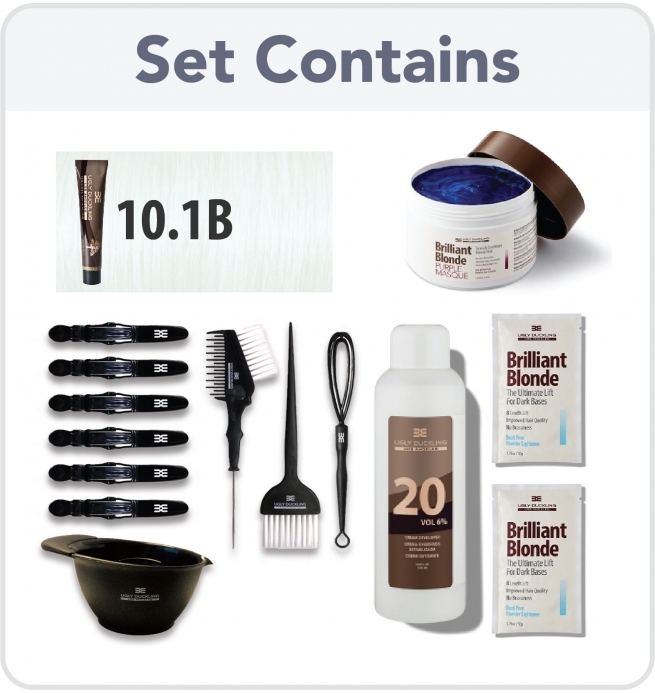 This will ensure a rich and vibrant color result. When lengths are done, apply on the root area. 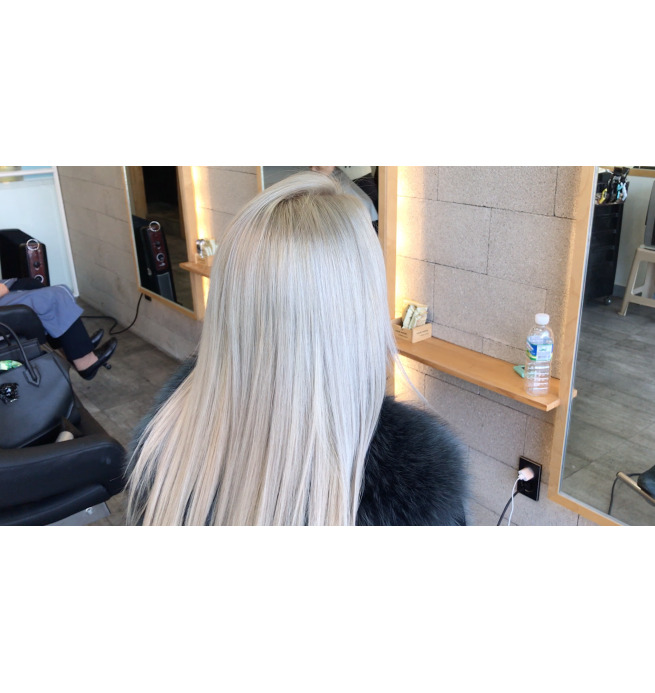 This is a regular color, not a toner and requires the full processing time to get the correct color result. Rinse hair with water thoroughly until all the pigments have been washed out and the water is running clear. Then apply a large quantity of purple mask and massage in thoroughly. Leave in the hair for 5 minutes, ideally with some indirect heat. Use a plastic cap if you don't have access to a heat source. The heat from the scalp will do its job. The purple mask will close the hair cuticles and provide deep conditioning to the hair. 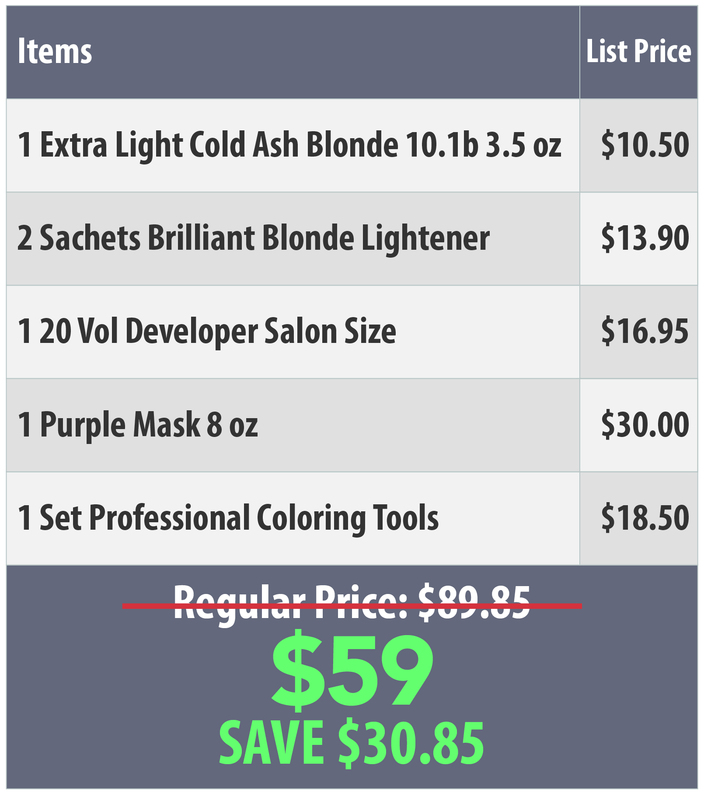 It will also help in removing any remaining yellow still in the hair and get the hair to a very cold ash blonde look. Use the purple mask once a week to keep your hair white and ashy. You should have plenty of product left over (especially developer & purple mask) for future retouch applications and for maintaining your look. You should have plenty of product left over (especially developer & purple mask) for future retouch applications and for maintaining your look. Rinse hair with water thoroughly until all the pigments have been washed out and the water is running clear.